open your pack of tofu and drain all the water you can. wrap the block in a few sheets of paper towel, put it on a plate, set a cutting board on top, and place something heavy on the board. let the tofu sit for a few minutes. you’ll be surprised at the amount of water that comes out. while your tofu is draining, sharpen your knife and get out those veggies. cut the base off of the green onions and chop them as fine as you possibly can. next, julienne your cucumbers. you’ll end up with a lot, so don’t worry. we’ll use them all, i promise. get out your micro-plane/oroshi board. peel and slice the ends off your garlic cloves. grind them into a super fine paste. add a cup or two of dashi to a pot. remember, it is very important that you know your dashi. if you are using instant granules, make sure to taste your broth to check its saltiness. in my opinion, it is always best to make your own dashi. that way, you can choose how fishy, how smoky, or how fresh you want the flavor to be. i won’t go into dashi here, but rest assured it deserves a whole week of posts. bring the dashi to a very slight boil and add about 2/3 of your ground garlic. stir the dashi and give it a taste. it should be pretty garlicky. i like to add a tiny bit of black pepper as well, but most japanese people cringe when they hear “black pepper” and “miso” in the same sentence. turn off the burner and set your pot on a counter for a few minutes. ladle a little bit of dashi into a small bowl. add your miso to this small bowl of dashi, then mix well. if you aren’t sure how much to add, start with just a little and build your way up. trust me, the nature of soup dictates that is a lot easier to add a little bit of saltiness to a soup than it is to remove it. reintroduce the dashi/miso mix to the pot. when you reach your desired flavor, you need to ready your ice. put a layer of ice, a layer of salt, and another layer of ice into a large metal bowl. nestle a medium-sized metal bowl into the ice. slowly pour your miso soup into the medium-sized bowl. you may need to periodically change the ice if it all melts, but you should be set. give the ice a little while to work its magic. while you are waiting for your soup to chill, ready two medium-sized japanese soup bowls. unwrap your tofu and slice two blocks big enough to rest in the bottom of each bowl. around the tofu, create a nest of julienned cucumber. scatter the thinly chopped green onions over the top of the cucumber. slowly and delicately ladle in chilled miso soup until the cucumber just barely protrudes from the surface. sprinkle sesame seeds over the nest. you might be thinking, “this tofu obelisk looks a little bare.” you would be right. go get your sashimi out of the fridge, ready a super sharp knife, and cut some nice thin slices. remember, mind the grain. cutting against the grain of fish with a dull knife is a recipe for sashimi disaster. 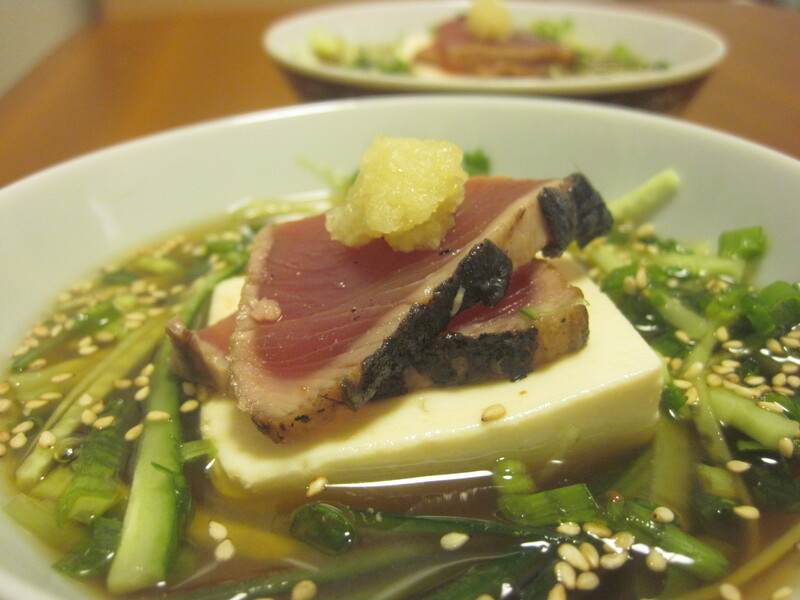 place one or two slices of sashimi on top of the tofu. last, take the remaining 1/3 of your garlic and place a tiny dollop on top of your fish. serve with sashimi, an extra fresh salad, and a few skewers of fresh-off-the-grill yakitori. watch the mouths drop open in disbelief and admiration. note: this recipe makes two medium-sized bowls of soup. if you are expecting a main course, you are going to be disappointed. this, like most miso soup, is a recipe to be paired with a few bites of three or four very delicious side dishes.